Boys don’t cry: It’s a stereotype that has persisted for generations. Their emotional landscape is often shut off, drained, diluted by expectations of stoicism and strength. But boys harbor feelings just the same; it’s a matter of expression. Recently, Stanford professor Judy Chu argued in her book “When Boys Become Boys” that culture, not nature, hamstrings boys’ socio-emotional skills. They can empathize, read others’ emotions and cultivate meaningful relationships. And yet, so often, boys adapt to cultures that require them to be stoic, competitive and aggressive in order to be accepted as “real boys.” It’s a survival skill. They benefit from this kind of assimilation to a degree: Is there anything more important than social acceptance as a kid? But as they align with these norms, they pay a psychological price, too, as they hide their emotions. This is troubling, regardless of context. But in the modern climate of the #MeToo movement, defining masculinity is even more essential—and, sometimes, confusing. “What does it mean to be a Jewish man in the 21st century? Look at Harvey Weinstein [and] Louis C.K. ; Jewish male figures are going down. Maybe we’re all terrible! This is a platform for boys to make sense of their social environment and what their role can be,” says Beni Summers from Temple Emanuh in Lexington. Summers is the temple’s leader for Shevet, a group for teenage boys to explore their humanity in a safe space. It was launched nationwide by Jewish education organization Moving Traditions, offering boys a space to connect, guided by a trained mentor. In the Sunday sessions, boys examine and challenge cultural messages about masculinity, power and sexuality within a positive frame. They meet monthly to play games, debate current events, watch and discuss news clips or controversial commercials and share food. One recent group watched a popular car commercial featuring a dorky kid avenging the prom, snatching the prom queen from her dapper date and anointing her with a passionate kiss. After watching, boys discussed consent and self-esteem. Other times, they might watch clips of Jewish men like Jonah Hill and Seth Rogen. “They might look at media about male beauty standards: hairless, gorgeous, perfectly groomed and muscular. Then you look at Jewish celebrities, and they don’t look like that. There’s a [stereotype] of a schlubby Jewish guy. What’s the message? Then they look at Jewish leaders from the Torah to the Talmud. Moses stuttered. King David was handsome and beautiful. How did that affect his relationships?” says Laura Hyman, Moving Traditions’ Boston director. It’s camaraderie with a purpose. No topic is off-limits: gender stereotypes, self-esteem, parental expectations, body image, academic pressure, dating. “Shevet gives me a place to comfortably share my feelings, bond with other Jewish teens and learn about how to be a modern Jewish adult and man,” says Noah Lion, one of the teens at Temple Emunah. 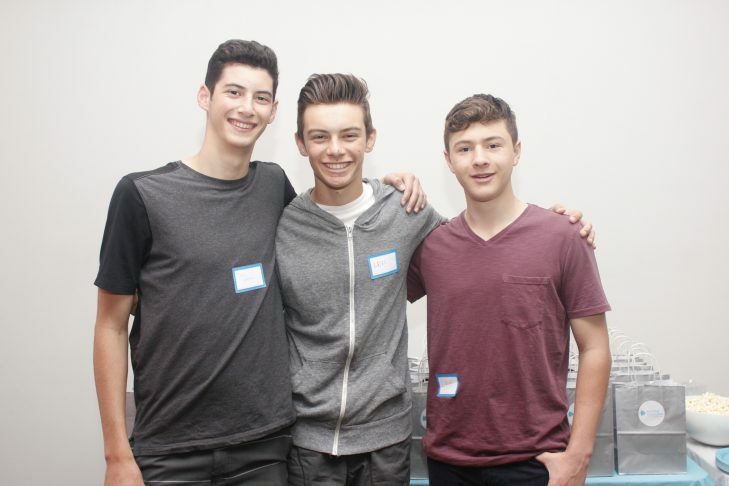 Shevet, which means “tribe” in Hebrew, was launched in 2011 following years of research about the needs and interests of Jewish teen boys, including 40 focus groups with boys who had celebrated their bar mitzvah and were no longer involved in Jewish life. It was started partially in response to a similar Moving Traditions group for girls, Rosh Hodesh. Today, there are Shevet groups at 120 temples, JCCs and day schools nationwide. “The group came out of a deep sense of equality and a sense that what is so valuable for girls should also be in the lives of boys,” says Rabbi Daniel Brenner, Moving Traditions’ chief of education. Shevet starts in eighth grade with a standard nationwide curriculum with clear-cut goals: Boys explore what it means to be a mensch and what it means to be a man; acquire the social-emotional skills, including listening and critical thinking, to better navigate relationships; build honest and supportive friendships with other Jewish boys; learn to recognize and resist sexism, personally and as upstanders in their communities; experience Judaism as personally relevant; and strengthen their relationship to the Jewish community. But local leaders can tailor their curriculum to fit their group’s needs, says Summers. “Male spaces for sharing and openness is lacking. They feel it viscerally when they go out into the world and have these profound complex emotional development experiences and nowhere to park them,” he says. His group begins with a blessing over grape juice to signify that their time together is special and sacred. Then they play a card game to settle into the space. Then they talk about their feelings, whether it’s trouble in school or concerns about dating or the pressure to be athletic or cool. “Here, these feelings are held with honor,” Summers says. Find more about Shevet and Moving Traditions here.